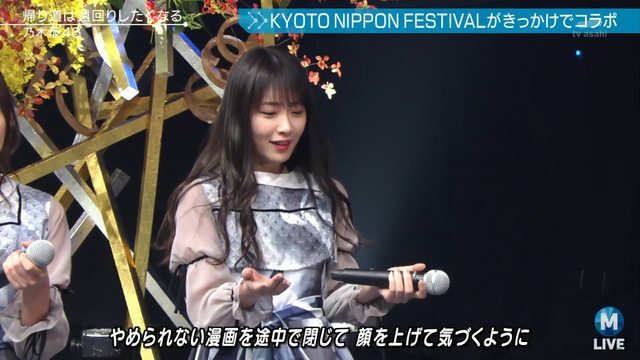 Discussion in 'Nogizaka46 News & Releases' started by ForrestFuller, Sep 24, 2018. Lol, I was wondering why the individual members' threads were so quiet about the individual PVs. All of them are in the single's thread, sorry my bad. Ok, I think Reika's PV is really hilarious, it's like Sony finally realize it's much better in 1080p than 480p, like after so many years lol. No luck on Spotify yet (at least not in The Netherlands). It's on Spotify in Japan. Nogi music is available on Spotify worldwide for a while now. But new releases take some time and unfortunately, a vpn doesn't work in this case. Last time, it took about 2 weeks. Now that I finally can listen to the high-quality version of the single, I can really appreciate the songs. Kaerimichi is really a nice, bright song suitable to send off one of the best members of the group. I just notice that some Harujion "motifs" are present in the song. Don't know whether it's real or just my imagination. Caravan is also another great song, IMHO. Tsudzuku is heart-wrenching without being too sentimental, even without the video... really fits Nanase. Nichijou is... what can you say? It's an Unders song and they always get one of the best songs in a single and they never disappoint. 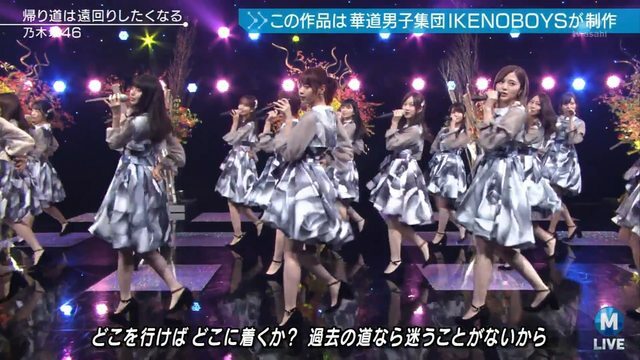 Kokuhaku is not my thing... too bad, it's Waka's swansong. Chopin is actually quite nice, although not something I expected it to be. Shiritai is also nice... not the best song ever, but nice. 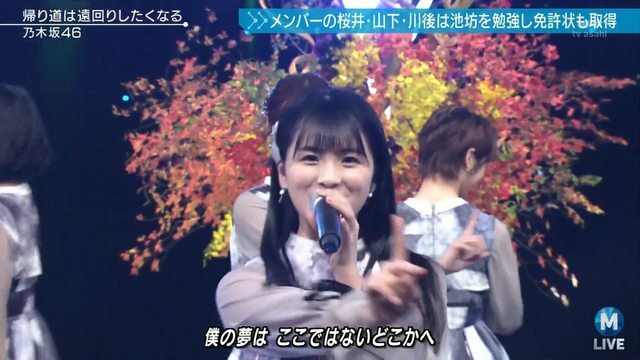 Overall, this is another strong single for Nogi. I just notice that some Harujion "motifs" are present in the song. Don't know whether it's real or just my imagination. It is, especially the first part before the vocal. If I compare it to all their singles regardless of when they got released, it is a very good single (especially compared to the last one which I found to be so bad I don't even have it saved in my music library). The songs have some decent vocals and the variety is good enough. If I compare it to their past autumn singles, however, it is the worst one. 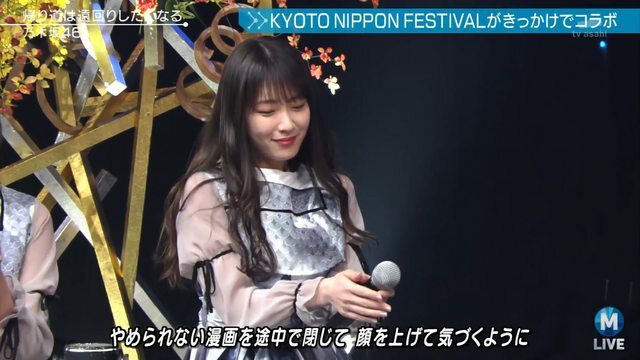 Personally, I am a much bigger fan of autumn-winter songs and as a result my three favorite A-side Nogi songs are all autumn songs (今、話したい誰かがいる、サヨナラの意味、バレッタ in this order, tho the spring 気づいたら片想いい is a close third). For my taste, the songs aren't bad, but they aren't top tier either, it's somewhere in the middle, mediocre. They’re all Aces in my book. I love the choreography . The spinning at the beginning was so good like they do ice skating. And then Takayama . I don't know but somehow it's so funny to me. Sorry Takayama. Those back and front steps were so elegant. The way they moved their hands to their hips like a karate pose, so cool! The final scene is a tear drop. thanks Msta and sony for giving yumi deserving focus during the song. never thought that they will be captured in a frame in the ending of the song. awesome director. Maimai doppelganger or the real Maimai? !